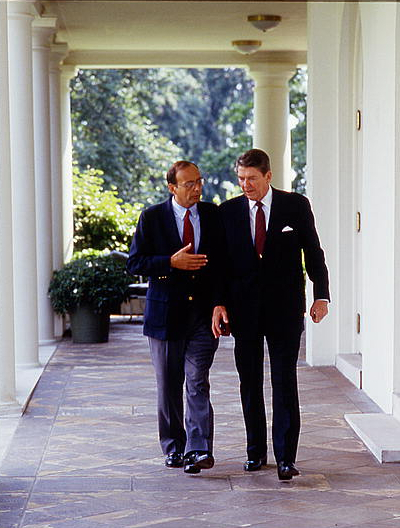 Ronald Reagan walks with Senatorial candidate Al D’Amato in 1986. Photo donated by Carol Highsmith to the Library of Congress, public domain. Up next in putting midterms into historical context is Ronald Reagan. He was the first president since Eisenhower to serve all eight years of two terms. The year 1986 was a moderate change of power election, not a sweeping change with numerous seat pickups. The Democrats gained five seats in the U.S. House of Representatives and eight seats in the U.S. Senate, taking control of the Senate for the first time since 1980. Though Reagan’s approval ratings were in the 60% range in 1986, many of the Republican Senators up for election held freshman seats that were more difficult to defend. Like Clinton after him, Reagan had already faced his worst midterm. In 1982 Reagan’s approval hit 41%, among the lowest of his presidency, and the Democrats gained 25 seats in those midterms. Because the economy had improved significantly since the 1982 midterms, the Democrats made only modest gains in the U.S. House. This entry was posted in History, Politics and tagged #TBT, 1986, midterm elections, midterms, Ronald Reagan. Bookmark the permalink.